It can be hard to try to remain unbiased and objective when you’re dealing with something near and dear to your heart, or in my case, belly: trying to find the best East Coast-style donair in Ottawa. Businesses’ pictures with lettuce in them, and the common, vaguely-named “sweet sauce” don’t exactly inspire confidence, but I do what I can to base my opinion on the quality of the product alone. Inevitably, one of my stops was going to be at a larger local pizza chain, Gabriel Pizza, who I saw in my online research carried donairs. 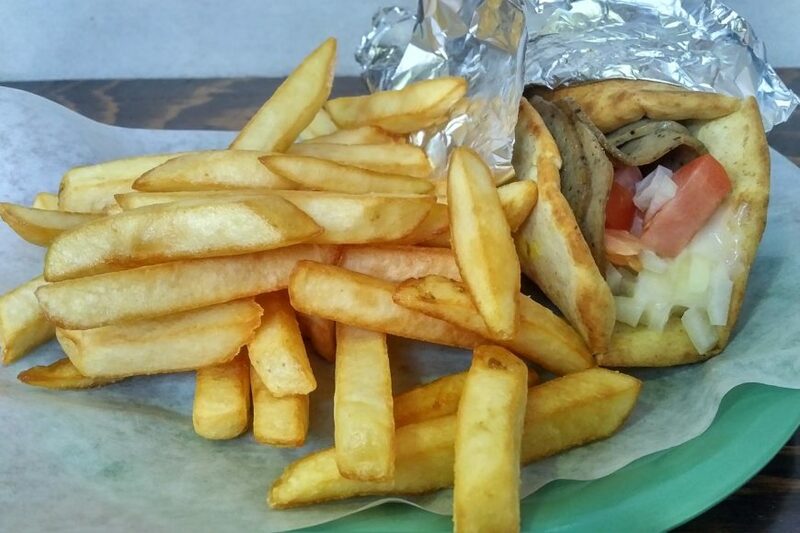 They even offer a special with them in it – two donairs and two pops for $14.50. It’s hard to be more than a few blocks from a Gabriel when you’re anywhere in the downtown, so I walked up to the one on Rideau Street while at the Rideau Centre. Arriving just before supper time, the restaurant was pretty quiet. The digital menus above the front counter aren’t as helpful as they should be, as they don’t show the full menu so much as their specials, but I was able to see that they did have donairs at this location. I ordered a small, as well as a slice of pizza. 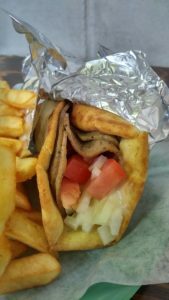 You can get whatever you want on your donair, but the standard comes with the meat, lettuce, tomato, onion, and garlic sauce. I put a hold on the lettuce and switched from garlic to sweet sauce, then settled in at their oddly low counter to wait for my feast. Shortly after, I was informed that they had rang me in wrong, for a sub instead of just the pita, so I could get a refund and get put through again, or they could make my pita a platter by adding fries. I decided on the latter option, doubling down on my caloric intake. It wasn’t long before my insult-to-the-Canada-Food-Guide-on-a-plate was before me, and one of the staff offered to pop my slice in the oven – yes, please! The fries were the typical from-frozen, thick-ish, diner fries, and they were scorching hot. They were a bit under seasoned, but some salt took care of that. On the upside, they were fairly crispy, so okay all in all. 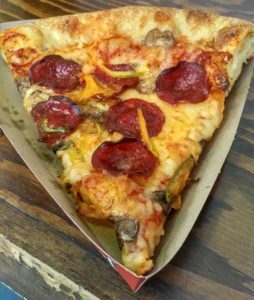 The slice of pizza (they called it “all dressed” instead of “works”, which was weird) was actually pretty good, especially considering that it was 4pm and who knows when the pie was originally cooked. The crust and cornicione were super airy, and had a pleasant chew. For a guy that’s used to the glory of Pictou County pizza back in Nova Scotia, it was a little on the bland side, but the fundamentals were all there. It was definitely head and shoulders above Pizza Pizza. Last but not least comes the reason I was there: the donair. Good sign: grilled pita wrapped in foil. Bad sign: pallid slices of meat wrapped around the tomato and onion. I typically don’t expect donair meat in Ottawa to be shaved off of a fresh spit, but it’s always disappointing (and a mild health concern) when it doesn’t get finished on a grill for extra flavour and crisp edges. Plus, the slices of meat made it more like a deli sandwich and did not help the texture. The flavour of the meat was OK at best; not bad per se, but too tame, with no spice to it – if I was blindfolded I’m not sure I could identify it as donair meat. 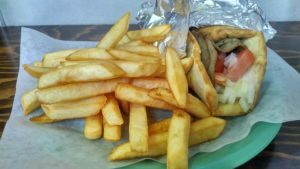 The sweet sauce lived up to its name, but the taste was more mild, and the amount much more sparing than the hot mess that a true Nova Scotian donair is – so it mostly got lost in the onion and tomato. If you’re an ex-pat Nova Scotian looking for your donair fix, you’re probably better off going elsewhere, unless you’re pretty plastered. Otherwise, stick to the pizza and you’ll be doing A-OK. If you want a real Nova Scotian donair and garlic fingers in Ottawa, go to Centertown Donair and Pizza! It’s just like back home! There’s also some other donair diamonds in the (very) rough if you check out my ongoing hunt for the best east coast-style donairs in Ottawa. Thanks for following along, and let me know here or on social media about any other donair finds!